Below are research project opportunities within the Astronomy & Astrophysics group. Most are suggested project topics without funding necessarily available and will evolve over time. There is a range of competitive scholarship funding and more information is available on the college website. Formal applications are made through The College of Science and Engineering and students need to indicate the project title or area they would like to work in. So the prospective students should first contact the supervisor concerned for more details of the projects. We will be interviewing candidates starting in early March, so applications should be made to the College of Science and Engineering by 14th February. The project will utilise high resolution data from a number of spacecraft, and involves programming in IDL. Depending on the interest of the student, numerical modeling in collaboration with colleagues from Oslo is also a possibility. Examination of the magnetic field variations at the location of flare optical emission. The project will utilise high resolution data from ground-based instruments (but may also involve Solar Optical Telescope on the Hinode satellite), and involves programming in IDL. Depending on the interest of the student, numerical modeling in collaboration with colleagues from Oslo is also a possibility. A tornado observed on 2014-07-15 by SDO/AIA at 171 Å. The existence of tornado-like prominences (‘tornadoes’) is one of the major puzzles of our understanding of the solar corona. Observations from the EUV to the infrared reveal complex plasma motions which are difficult to interpret due to projection effects and lack of information about the magnetic field supporting the plasma. These dynamic structures are often associated with prominence legs (above the solar limb) or filament barbs (on the solar disk). They’ve also been associated to prominence eruptions. They represent essential case studies for deepening our understanding of the Sun’s corona. A goal of this project is to examine the temperature, density and velocity of the plasma for several well-observed tornadoes using multi-wavelength data, and to identify the mechanisms responsible for the observed shapes of optically thick line profiles in UV and EUV by comparing them with those computed from 2D NLTE radiative transfer models. Another goal is to examine the association with prominence eruptions and identify which mechanisms may be responsible for triggering the eruption. The student will work on EUV-UV-optical-submm imaging and spectroscopy of tornado-like prominences, and on Non-LTE radiative transfer modelling of tornado-like prominences. The student will hereby develop advanced knowledge of solar prominence physics, spectral line formation, radiative transfer modelling, solar data analysis and solar spectroscopy. Particle acceleration is a ubiquitous cosmic phenomenon from the scale of active galactic nuclei down to planetary magnetospheres with the resulting fast particles having an energy density high enough to influence their environment. Acceleration processes are far from well understood, either theoretically or phenomenologically from data interpretation. The nearby sun offers a unique opportunity to study particle acceleration via high resolution spectra and images at radio to gamma-ray wavelengths from ground and space observatories, and by direct particle detection in space, As the UK Co-I Group on the NASA high energy RHESSI solar mission, Glasgow is involved in a wide range of theoretical and numerical projects on diagnosing data on solar electron and ion acceleration. 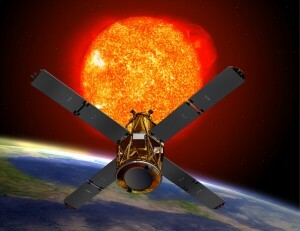 The physics of the solar system plasma in the near-Sun environment and further into space – the heliosphere – is studied by means of in-situ observations of particles and fields and low frequency radio emission and supported by theoretical calculations of the plasma wave, wave-particle and particle transport processes that link the Sun to space. 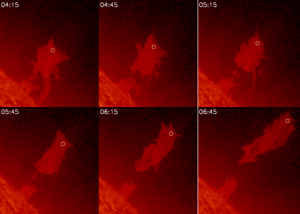 Evolution of the 2010-06-13 prominence eruption. Solar prominences are large magnetic structures confining a cool plasma in the hot corona, surrounding a polarity inversion line in the photospheric magnetic field. Once prominences are formed, they can remain stable for over a solar rotation and are an integral part of the solar corona. 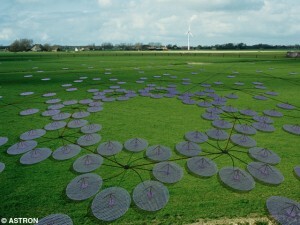 The conditions for their stability are inherently related to the associated magnetic configuration. Some disappear quietly, but most disappear in a more dramatic fashion in association with a Coronal Mass Ejection (CME). A CME has severe impacts on the heliosphere and planetary environments, and thus has become a central topic of research in the field of Space Weather. 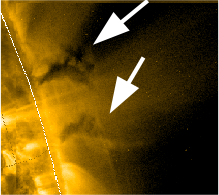 The aim of the project is to develop a model of the plasma during the activation and the eruption of the prominence. It will be based primarily on non-local thermodynamic equilibrium modelling of the radiative transfer and the synthesis of spectral lines formed under different physical conditions. This will be compared with (extreme) ultraviolet observations from the SOHO, TRACE, Hinode, STEREO and IRIS spacecraft, and observations from ground-based observatories such as ALMA. Ions are accelerated into the GeV energy range in solar flares. At these energies, nuclear reactions in the solar atmosphere result in gamma-rays and energetic neutrons that can be detected in space. This project will use Monte Carlo codes to follow energetic ions in the solar atmosphere and predict the radiation that results from nuclear reactions. The results will be compared with measurements of gamma-rays from Fermi, RHESSI and other space missions with the aim of constraining the number and energy distribution of ions accelerated at the Sun. Pulsar atmospheres consist of electron-positron plasmas. Such plasmas are very energetic, and given that the positive and negative species have equal mass, these plasmas have unique properties. We are investigating wave propagation in magnetised pair plasmas, from the perspective of trying to understand the wave processes that could contribute to the pulsar radiation source. To date we have examined the radiation damping of quasi-linear electron-positron plasma oscillations, using computer simulations. Complex analysis has allowed us also to reformulate the Bernstein modes in a weakly relativistic pair plasma, with a view to studying how such weakly damped magnetic modes might act as a vehicle for radiation transport in a non-uniform plasma. creating the necessary relativistic transformations that allow the radiation field to be translated into the observer’s frame. The role of the magnetic field in medium scale cosmic evolution is not well understood, given the complexity of the possible interactions. We aim to focus on two specific areas: (1) the natural evolution of jets and other linear structures, and (2) the development of density structure in large-scale mixed flows of plasma and neutrals. A project to model (i) the impact that a plasma source can have on neutral gas and (2) the time evolution of the sheath around a free-surface in a streaming plasma. In plasma acoustics, the ion wind and localised heating of a plasma source in a neutral gas can trigger significant sonic disturbances. In the sheath stability studies, the electrostatic environment at the perimeter of a possibly deformable conducting (or dielectric) structure placed directly in a flowing plasma. These projects are computational and analytical in character, sharing basic plasma physics but applied to different situations. Several competing scale-lengths will contribute to the complexity of the evolution: the collisional mean free path of the plasma, the free-fall sheath length scale, the typical wavelength of deformation of the conductor and the scale-length for non-uniformity of the plasma flow. The competition between these characteristic scales will lead to strong time-dependence in the local electric field, and the consequence non-linear feedback on both the impinging plasma flow, sonic disturbances and the free-surface deformation of the obstruction. A numerical and theoretical investigation of Alfven ionization processes in strong solar photospheric flows. The kinetic energy of mixed-species neutral gas flowing through a magnetised plasma can result in pockets of energetic plasma electrons (confined by the magnetic field) that are able to ionize specific neutrals in the flow via electron-impact ionization. 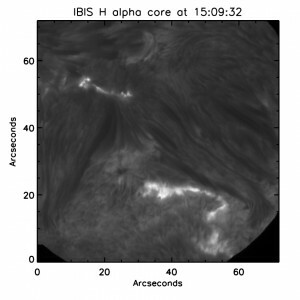 Such a process has already been implicated in creating the anomalous chemical composition of the solar wind; we aim to extend this study by correlating solar surface flows and magnetic structures together with improved data on solar abundances to clarify the overall picture of ionised species evolution in the magnetic environment of the sun. the investigation of the differential diffusion of minority species in order to model directly the resulting abundance anomalies in the solar wind. The evolution and character of plasma dust has wide-ranging implications for astrophysics and laboratory plasmas, including fusion and plasma processing. Whilst there are many studies of plasma crystals, there are fewer investigations of the more profound problem of growing the dust from first principles directly in the plasma. Classical condensation mechanisms are not as relevant in the plasma context, since in the latter the local electrostatic conditions can influence enormously the conditions for dust growth, leading in some cases to naturally occurring prolate-spheroidal dust shapes. The implications of non-spherical dust grains for electromagnetic extinction and polarisation in astronomical observations are well-known, but though progress has been made in characterising the effects of composite grain structure and spheroidal shapes, there is little in the way of a holistic approach to the problem. To discuss further your interests, please contact group members directly with any questions.